Netflix likes their employees to have fun. I just found out that the company conducts “hack days” where employees are given 24 hours to develop crazy and wacky gadgets for the movie company. 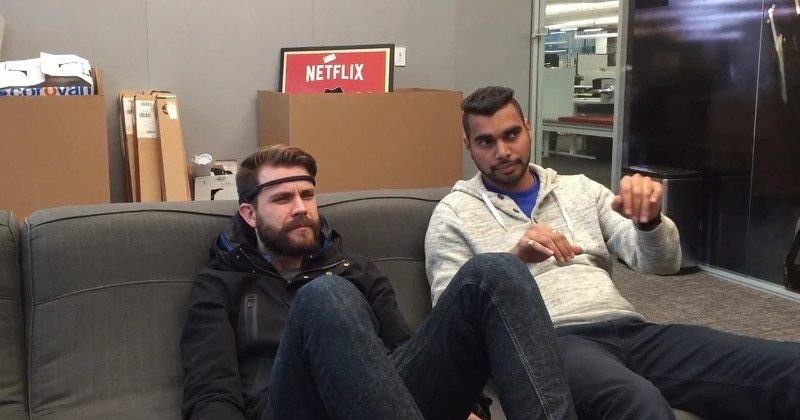 Two engineers just invented Mindflix, a special headband that helps you surf Netflix using your mind. All you have to do is move your head to the side to scroll, and then think “play” when you see a title you want to watch. This gadget could replace the remote control. The Netflix’s engineers achieved this task by customizing a brain-reading headband made by Muse, which is usually used for guiding meditation. Muse measures whether your mind is calm or active. The headband is sensing brain activity and using the feedback to control certain pre-established actions. Watch the video for a better explanation. No word if Netflix plans to pursue this idea, but they told the press about it. That always means something.